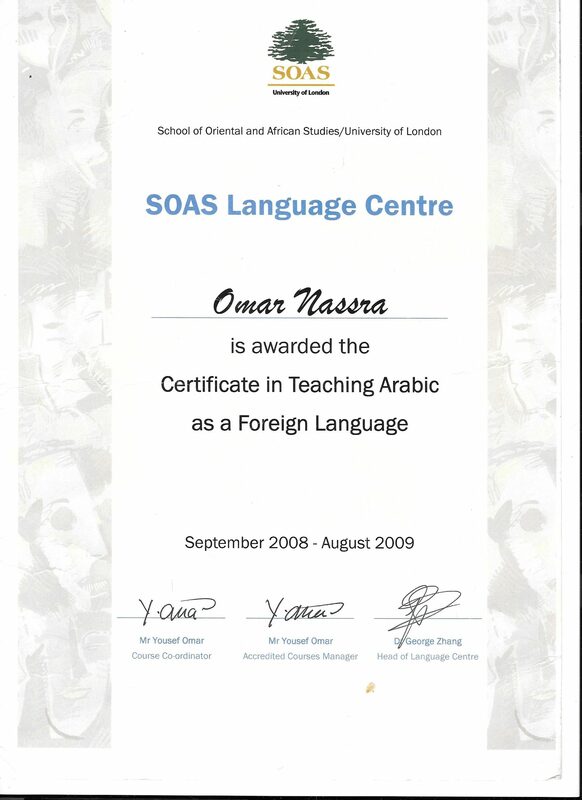 Omar Nassra is a fully qualified teacher of Arabic, holding an Arabic teaching certificate (CTAFL) from the School of Oriental and African Studies, a recognised and highly regarded school of languages and language teaching. The School of Oriental and African Studies is a constituent college of the University of London and is ranked as one of the top 50 universities in the United Kingdom according to the Complete University Guide. The 2016 QS World University Rankings places SOAS 46th in the world for Arts & Humanities and 11th globally for Development Studies. The school boasts the first established linguistics department in the UK, founded in 1932 as a centre for research and study in Oriental and African languages as well as one of the best student-staff ratios in the country. The School of Oriental and African Studies is known for training government officials from all over the world and acts as a consultant to government departments and large businesses on matters concerning Asia, Africa and the Middle East. This high standard of education means that Omar is not only has expert knowledge of the Arabic language but also has a deep understanding of the best teaching methods and most effective methods when approaching a new language. This means that the courses offered, such as the Nassra Arabic Method, are designed to have students speaking Arabic quickly and confidently, in a way that will be useful to them, whether it’s doing business with overseas clients or simply being able to talk to a spouses’ relatives. This qualification is recognised among language teachers as a reputable and highly regarded certificate. The training includes in-depth study of the way people learn languages, how to measure learning progress as well as how to recognise which teaching techniques will be most effective for an individual person, and how to apply those techniques. As a result of his comprehensive training and own passion for teaching Arabic, Omar is now able to pass on his knowledge and expertise, offering his students top quality tuition in both MSA (Modern Standard Arabic) and spoken Arabic for students of all skill levels. 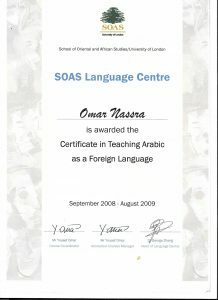 Omar uses a combination of his teaching skills developed at SOAS and his personal knowledge of Arabic to provide his students with a unique and practical approach to learning the Arabic language. You can read more about the qualification here. You can find out more about The School of Oriental and African Studies here.